It is Friday night and I am sitting in a coffee shop ( I love coffee shops.) It is snowing outside and I am feeling very cozy. I know there are a few of you who are on the fence about starting your own business. It is scary to think of becoming an entrepreneur. It can be overwhelming. It can feel impossible. It can feel too expensive. When you sit with your quiet self and dream about this business, what holds you back? All of the above? Are you in lack mindset? Or abundance and enough for everyone mindset? Think about this for a minute. Feel it. It is easy to default to what feels like impossible and for someone else. Who are you to take on running your own business? Right? I have been there. I am still there actually. I get stuck in that mindset too. Still! Believe it or not. I have been an entrepreneur for 18 years. I deal with fear on the regular. Trust yourself. You have what it takes. The only thing holding you back is your own fear. I know that is a biggie. Honey, I believe in you. You can walk through it and you will thank yourself for it. I really will take your hand and walk you through this program. My videos are easy to follow and I am available for coaching through the process. It is time to take the leap. Did you know that if you start now, you can have your own ceramic handprint business up and running in time to create keepsakes for the holidays?! Yep, it is true. Hello Lovelies! Here is another one of my trainees. Meet Kristin! She has a beautiful business in Texas! Here are her words about my training program. Her business is.....Love In Clay. Hello....I am Amy! Welcome & a quick intro. I FaceBook live regularly over on my Facebook page. If you are not part of my FB community, why not?! :) Join me. Head over to Facebook and look up Ceramic Handprints & Training and you will find me there! Here is my FB Live from today! So many of us moms are looking for a way to make money AND stay home with our kiddos. This is THE BEST part of having your own Ceramic Handprint Impression business, you are the boss and you get to mold this around you and your family. I love what I do! You know, my favorite part of my business is meeting amazing people from around the world and right here in the USA. Patricia C. is from Alabama and she has a beautiful business. Patricia, you are a delight and I have loved working with you! "I loved training with Amy. I scraped up and sold what I could to get into this business because I wanted it so badly. I only needed to watch the videos once, taking notes, then I was able to soar from there. Since then I've come up with many ideas of my own and learned my own tricks. My business picked up after about a year (mostly due to lots of big changes and sickness so I wasn't able to market much for a while) and now my hard work has paid off. Amy has great suggestions for marketing that has really helped me. I've been in direct sales before and I was never any good at it! I had trouble marketing, the products weren't unique enough because EVERYONE was doing it, and most importantly....I was not in love with the products, myself. But THIS business I am truly over the moon for. I love meeting the families and making them smile with the precious pieces I'm creating for them. I knew this would be a great business for me because I absolutely *needed* these pieces made for my own babies. Learning this art has been so exciting and to this day I am absolutely giddy to open up the kiln and see the finished pieces. I'm so glad I found Amy and I highly recommend the program. You have heard the phrase, Success is on the outside of your comfort zone, right? Well, guess what? It is true and there is really no way around it. So, buckle up and get moving. My Facebook Live from Monday February 13, 2017. My Book of Ceramic Handprint Trainees! Are you in it? It has been my intention to help other women build a successful business Ceramic Hand & Footprint business. I have been very blessed to add names each month to this book. I would love for you to join the group of amazing souls who grace these pages. Women who were courageous enough to take a leap of faith, even when they may not have felt completely ready. Another Successful Ceramic Handprint Artist, Stephanie! I am thrilled to introduce you to Stephanie Councill. I have been working with Stephanie for the past several months as she is getting her Ceramic Handprint business up and running. It is very rewarding to see those who take training seriously, follow the steps, spread their wings and fly! Stephanie has a beautiful business in Virginia. It is called Impress Me, Custom Ceramic Prints. I am here to help you get going and the good news is I am just a click away. Please reach out anytime and let's get you started! It fills me up to be able to help others run a successful home business, especially one that is profitable. Several years ago Jen reached out to me from the Philippines and was curious about starting her own ceramic handprint business. Of course I said yes and we got right to work. Jen is a huge breast feeding advocate and she has found a perfect way to combine her passions. Here are a few words Jen had to say about training with me. "More than the excellent training package (including the DVD, manual, starter kit, video blogs etc), it is the trust and the helpful voice of Amy that is the winner with this whole training. I live outside USA so I don't have access to stores or shops that otherwise is easy to find for US residents. But Amy was very patient and helpful in giving me all the information I needed. She went well out of her way to help a trainee she did not even know for long. And I think this is what sets her training apart from other ceramic impressions training out there, her dedication to help and make you succeed. This is the perfect business for a single mom like me, who wants to give more time to her son but still bring income to the family. -Jen, MNL"
I am waiting for YOU! Let's get busy getting you ready for your own business. What is Ceramic Handprint Training & What Type of Person This Business is Good For? I am loving FaceBook LIVE! It is exciting to be able to connect with you in real time. Last Friday on FB LIVE, I talked about working from home and how moldable this business is for you and your family and also what type of person I am looking to work with. Taking a leap into the entrepreneur world can seem overwhelming. I want to take that fear away and let you know that you can do this! I am here to help you and encourage you along the way. 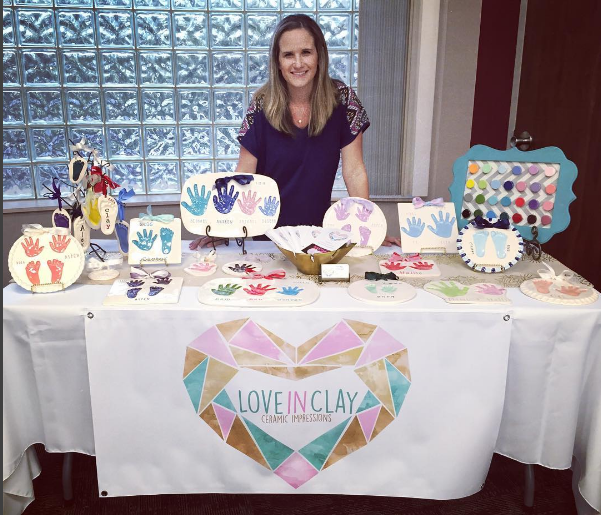 If you have been thinking about starting your own ceramic handprint business for awhile now, this is a great time to get started. Make sure you watch through to the end and you can hear about an amazing offering I will be giving out during the month of May. Have a super week and I will be back with more information for you each week. Well, I am doing it! I am starting to experiment with Facebook LIVE! It is exciting and scary and the same time. Have you heard of it? You can actually record in real time and have your followers/customers watch you and interact with you LIVE. If they miss the live broadcast they can always catch the replay. I feel it is important for you to get to know me. If you are interested in starting your own Ceramic Handprint Business and you are getting ready to invest in my training program, it is only natural that you would like to know who I am. I totally get that! So, with that said, I will be leading by example and using the new Facebook LIVE tool, about once a week. If you catch it LIVE, I would love to see you pop on and comment and ask questions. That way I can get to know you and you can get to know me. As always, let me know any Qs you may have. I am ready to help you get going, when you are ready to take the leap. Words from one of my CHT Trainees ~ I love my job! Being a business coach, I get to help so many amazing people start up their own Ceramic Handprint Impressions business and I love it! I love everything about it. I get to be part of the evolution of someone's dream. It is fun to see all the Qs that come up at the beginning and then to see the confidence build as you step into the role of business owner. I get to see my trainnee soar as they start the process of learning the ins and outs of this business. I am thankful for this process. It fill me up! I have just recently wrapped up my training with Kristin and this is what she had to say about my training and working with me. Even though I "officially wrap up training" I am always available for questions down the road. I have had some of the people I have trained email me years into their handprint career and ask a few follow up questions. I always love that too. Lets me know they are still working their business and that things are going well. I just wanted to share this testimonial with you because I know it can be scary when you are trying to make the decision to start. There are many things you have to weigh out to see if this business is right for you. BUT with that said, often times it is just the need to walk through your fear and JUST START. Taking the first step is the hardest part. Once you begin, everything will fall into place, as if it was just waiting for you to say.....let's go! If you pick me to help you along the way, I will be very honored. Is Working for Yourself a Good Idea? Many people dream of being their own boss, starting a company and have it flourish. There is a freedom that comes with running your own business. With that said, it does not mean it is all rainbows and butterflies. There is actual work involved. Crazy, I know. Will you be a good boss for....YOU? There have been many days, as I have been working for myself, for the past 16 years or so when I have had a crazy busy day, when I think about working a job that I just click in and out of. Sometimes working for yourself can be a bit stressful. You are doing all the parts of a business that big companies hire many different people to do. You wear many different hats when you run your own business. There is much to learn as an entrepreneur. Once you decide that you are going to work for you, you need to implement some strategies that will set you up for success. Those strategies are a bit different for everyone and you will have to figure out what works best for you. But that is the fun part. YOU get to figure it out. It is not always a smooth road, not going to lie about it. There is a steep learning curve when you start building a business. It is not as easy as hanging an "OPEN" sign on your front door. There is work involved. Lots of it. Now, I am not trying to scare anyone away from starting your own business. I am selling a business training program for crying out loud. But I am saying it is not for everyone. Is it for you? But when you make the decision to jump in, be prepared to learn and to learn a lot! The reward of you putting the work into your very own business is worth any uncomfortable personal growth that comes with being your own boss. Be prepared to learn and grow a lot. I consider myself an introvert. I am quiet and shy by nature but being my own boss meant I had to put on my big girl pants and get busy. I have really learned more than I ever thought I would about being a business owner and entrepreneur. BUT that is one of the best parts of being your own boss! You will learn and grow in ways you never thought you would. It is exciting. You get to create the kind of business you want. You get to decide how to interact and be with your customers. You get to decide when to work. you get to decide how much to charge. You get to decide the style and aesthetics you want your business to portray. You get to decide the quality of work you want out in the world. YOU get to make all the decisions, and that my friend, is a beautiful thing. Are you ready for an adventure? Are you ready to bet on yourself? The good news is I am here to help you get going. I am here to answer your questions and make the initial steps of starting your own Ceramic Handprint Business successful. When you are ready, I am ready to help you. It is that time of year. New goals, dreams, things you want to make happen. Well, it is time to start doing. Taking action is the most important part of this process. To inspire you, here are a few photos of some impressions I have created recently. So many creative outlets are fulfilled through this business. Seriously! One of the biggest lessons I have learned in this business of creating ceramic handprint impressions is the trust my customers have in me, with their most preciousness, their babies. Over the years, I have had all sorts of parents come into my home. I have had the scheduled parent, the nervous parent, the blissful parent, the exhausted parent, the on cloud nine parent, the stressed out parent, the weepy parent, the casual parent, the flustered parent, the giddy parent, and on and on and on. We are all in the parenting experience together, even tho at times we feel very very alone. I know I did, as a mom of two small boys and now as they are teenagers, I still feel that way from time to time. But the feelings of new parents and parents in the thick of parenting several small children is mostly the same. We are all doing our best. You get to interact with these parents, for a small moment in time, as you invite them into your home, to create a priceless keepsake for them. Treat each interaction as special and meaningful. This is so very important. Your customers will know the difference. And this will make the difference between a so so business and a successful business. But, as all these different types of parents walk into my home with their little ones, they trust me to treat their children kindly and with respect. I take great pride in that exchange. I honor the roll of parent, no matter what type of parent you are. I get it. I understand. I have been there. The time the intersection of me meeting my customer happens, I am thankful that our paths have crossed. Sometimes the interaction with my customers is just that, a one time interaction in which I create a product for them and they go on their way. Other times, emotional, heartfelt conversations happen. I am always thankful for both. I have had customers confide in me all sorts of things. I am always so honored that someone would trust me with such moments. It is this reason that this business is so special and so much more than just creating handprints. This business is for the kind, the compassionate and the trusting. Your life will be blessed because you are the type of person who can step up the challenge of being trusted. You will be thankful you are trusted. I know, because I am. Look at each impression and interaction you create as something to be cherished. When you do this, you will know you have the perfect business. Are you a dreamer and a planner but not a great followthrougher? (I just made up that word, all one word, it is better that way) Ha! Years ago, when I was in college, my favorite part of each semester was organizing my schedule. I would pull out my Franklin Covey planner and go to town! I loved that thing. Yes, this was the late '80s, early '90s! The class option catalog, was just that....an actual catalog. No online registering. I would spend hours going over the course options. I would mix and match and pencil in and erase. And then finally pen in my masterpiece of a schedule. I loved that part. It was planning for the dream. Plotting and organizing, ohmygosh, I love that to this day. But, the nitty gritty of actually reaching your goals comes in the actionable steps that get you to your goal. I now had to show up to class, read my chapters, write my papers, listen to endless hours of instructing, go to the math lab (yuck) and study study study. Not the fun part BUT, a very very important part to attaining my goal of graduating from college. I actually did accomplish that huge task. It took me 5 years, because I kept changing my major and I even flunked a few classes!!! But, I did it. I made it to the end and I have my degree. Yay! I believe that the "dreaming" part of a goal is fun and exciting. There are few fears in that part of your dream. It is safe and it is fun because it is full of all things possible. But as we know from life, sometimes there are things we do no plan on that hinder our goals and dreams. But it is the journey of walking toward your goal where all the actual beauty lies. Whatever you are dreaming about, you have to put action behind your dreams. Or you just stay safe in that little bubble of dreamland. In your dreamland you say to yourself, "I think I can." That is a GREAT place to start! If you think you can, you will. Now just start moving. Get going. Make it happen. Why do I tell you this? Because, I know all to well what is like to dream and plan for something you want to accomplish but you may be scared to take that first step. In my experience that is the most scary step, starting. If you are considering starting your own home business, but you are not sure what steps to take first, send me a message. I will be happy to help you get on the path to being a business owner. I believe in you. Let me help you. I love helping to empower others through building your own business. This is a beautiful way to make money for your family. Send me a message, I am waiting to hear from you. It was just what I needed to see. I myself struggle with this. Do you? You rush around taking care of everyone and everything else and you are exhausted. And then when you think there will be time for you, there isn't. I know if I don't exercise first think in the morning, it will not happen. I often jump out of bed in the morning and think of the millions of things I need/want to get done in a day and I just start working. The mornings that I pause and meditate before I start rushing around and then fit in some form of working out, my day is SO much better. I go through periods in my life when I am really great about putting myself first and I KNOW life falls into place much more smoothly when I do. But then I just slip away from what I know is best for me ie. regular exercise, drinking lots of water, getting a good amount of sleep, meditation.... and all of a sudden I am letting go of my self care practice. Why am I sharing this with you? Because I dare bet we are a lot a like. We have similar struggles, dreams, desires. I need reminding that if I put myself first, everything else in life will be better and so I figured that you might need that reminder too. I surround myself with house plants. I love them. They add life and energy to the rooms in my home and they keep me company while working at home. I always make sure to water my plants regularly (of course I make sure to take care of them, lol) and my plants perk up each and every time I come around with their weekly nourishment. I think we are a lot like the plants around us. We need to be nourished too. We need to be watered and spoken nicely to as well. That includes the way we speak to ourselves! Remember that. The thoughts we think effect our life. Make sure you are speaking kindly to YOU. Super important. There you go ( and me too! ), our reminder to put ourselves first. Take care of yourself so you are better able to take care of others and/or take care of the things that are important in your life. I have a saying in regards to the practice of taking care of me, "don't think, just do." It is so easy to talk ourselves out of taking care of #1. So the next time you are laying in bed in the morning and thinking, I can just workout later or I need to just get something taken care of really quick (before you take care of you), say to yourself "Don't think, just do." Put those running shoes on or yoga pants (but really go to yoga) and like Nike says, "Just Do It." I am rooting for you. We got this. And of course, if you are thinking of starting your hand & footprint business, drop me a line. I am here to help you. That is what I do! Sending love and motivation your way today! Just had your first baby? Have several kids in school? Children leaving for college? Empty nest? Wow! As I type these different stages of life, I realize I am almost an empty nester. Not quite yet, and I do not want to rush the next couple of years away but I did just send my first off to college and my still at home son is 16. Time goes by fast and I am adjusting, once again to a different stage of life. Whatever stage of life you are in September is a time of reflection. Change is in the air. How do you keep up with change? How do you adjust? Keep going. That is really all we can do. Keep going. At 45 years old, I have been through many different stages of life. Most of them wonderful. ;) But I keep going. It was this time of year 15 years ago that I that I took a leap of faith and started my own ceramic hand and footprint business. I am so thankful that I did. Fall is a time of great reflection for me. It is my January, as far as the time of year I like to set goals. As time naturally starts to slow down during the month of September, or should I say gets back on a schedule, I like to look back over the past 8months or so and see if I am on track with how I wanted my year to go. How about you? Do you do that too? Time to start carving out something just for you. September is a time for me to reorganize and prepare for the rest of the year. I love it. It is my favorite time of year. I know for me business starts to pick up as many of you are contemplating starting your own business. Put me to work for you. This is a great time to start because you can be up and running for the holiday season. Many people love to have ceramic handprints and footprints made for holiday gifts. That means for you it is a perfect time to spend the next month or two practicing and then be up and running in time to deliver holiday gifts. I bet you are like me and sometimes you wonder how to keep all the changes in your life moving along. Well, my best advice, like I mentioned above, is to just keep going. Welcome change, embrace it. It is really all we can do. Starting your own business will bring lots of change your way. It will challenge you and help you do things you never thought you could. You will be learning new things and you will be working those brain muscles as you learn and grow. It is exciting. Look at these sweet baby prints. I bet you have imagined making these. You can and you can do it beautifully. I am here to guide you along the way. Sending you love and a virtual cup o' joe. Such the perfect time of year for all things cozy.